Bernie Wrightson’s Frankenstein Trading Cards #1-15 (1993) | 'TAIN'T THE MEAT… IT'S THE HUMANITY! A few months ago I posted images from comic book artist Bernie Wrightson’s Frankenstein Portfolio. That set featured six large reproductions chosen from 50 pen and ink drawings the artist created in the late 1970’s to illustrate Mary Wollstonecraft Shelly’s gothic masterpiece Frankenstein. Wrightson’s atmospheric illustrations proved so popular that as well as featuring in a special edition of the book (published by Marvel Comics in 1983) his artwork has been reproduced in three portfolio collections as well as several limited edition prints. 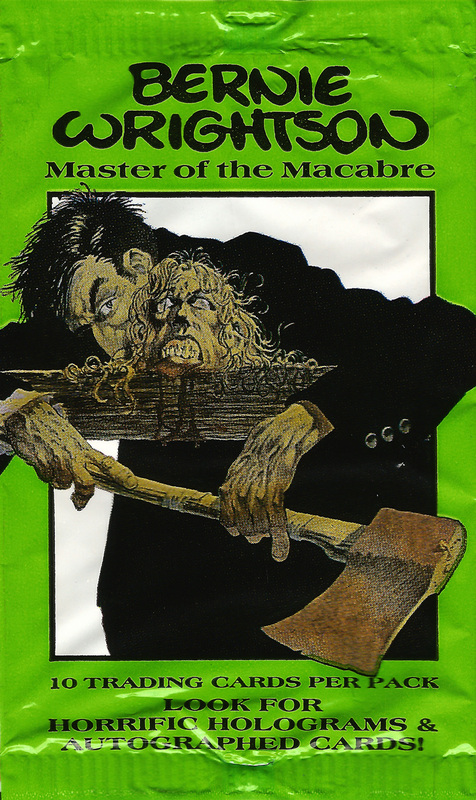 And at the height of the short-lived trading card boom of the early Nineties, 44 of his Frankenstein drawings were included in the Bernie Wrightson Master of the Macabre trading cards set released by FPG Cards in 1993. Every pack contained ten 3.5 x 2.5 glossary trading cards each featuring a drawing by Wrightson on one side and a short caption on the other. The Frankenstein cards were actually a 45 card subset of the main 90 full colour collection, and although I have the full set I much prefer his Frankenstein illustrations. Here are cards #1-15 from the set, both front and back (click here for cards #16-30).